President Trump’s pet insult for Rep. Adam Schiff is now the title of a bill that would kick the California Democrat off the intelligence panel. Rep. Matt Gaetz, Florida Republican and one of Mr. Trump’s staunchest congressional supporters, introduced the bill this week, titled the Preventing Extreme Negligence with Classified Information Licenses Act, or PENCIL Act. “It is the sense of the House of Representatives that Congressman Adam Schiff should be removed from the Permanent Select Committee on Intelligence of the House and that his security clearance should be revoked immediately,” the resolution says, according to The Hill. The proposal has slim to no chance of passing the Democrat-majority House under the leadership of Speaker Nancy Pelosi, who said last month she was “so proud of” Mr. Schiff’s chairmanship of the intelligence panel. 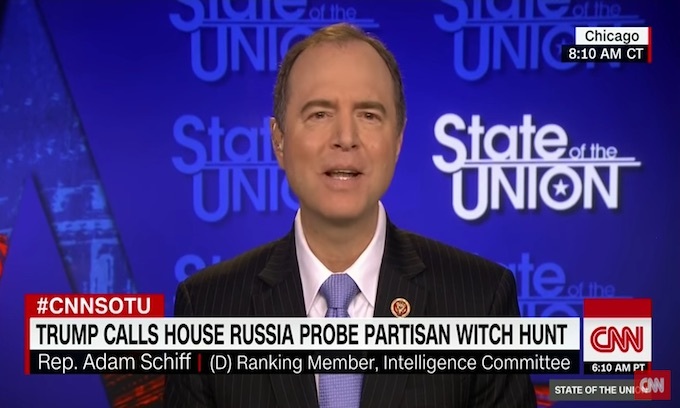 As chairman, Mr. Schiff is overseeing numerous committee investigations of Mr. Trump and insists there is plenty of evidence, contrary to two years of investigation by special counsel Robert Mueller, that Mr. Trump’s campaign colluded with Russian operatives’ efforts to interfere in the 2016 presidential election. I agree. And rather than just kick him off the intel committee, KICK HIM out of congress period. Didn’t he use to teach at South Park? There was a song in the 1950’s called Pencil Necked Geek. Lucky he wasn’t around back then. Keep putting the pressure on and remove Schiffty from Congress. He is a disgrace. Then once’s he is gone, DO THAT TO THE REST of the dems..
Schiff (and his fellow loonies) are magnificent ads for the Trump re-election campaign. They clearly reveal the insanity of electing any Democrat to any office, great or small. Keep screaming, Sharpton and Jackson (no one is listening). Keep promoting socialism, presidential candidates (you are moving voters in our direction). Keep threatening to take away all means of self-protection (you are selling guns and growing the NRA).